Projects across the city have used partnerships to effect creative and inclusive regeneration and community engagement, e.g. Fargo Village (working with developer); the Heritage Action Zone (promoting heritage-led regeneration), BID with over 700 businesses, 2021 City of Culture Bid. 120 languages are spoken in Coventry and many of the incoming population do not share or know the city’s heritage, but bring their own heritage and culture with them. The city has used the City of Culture Bid, the Heritage Action Zone and other local projects as routes to connect people with the heritage of Coventry and to help overlay the heritage of other communities. A focus on culture, arts and heritage has created a new narrative. For example, Historic Coventry has created a National Trust for Coventry with transfer of assets to ensure their future protection, a Cultural Places Partnership established, and the Great Places Programme funded through the Heritage Lottery Fund is promoting place and diversity and animation in the city. The focus is now fully on the bid for City of Culture. The city council benefits from strong and inspirational leadership. The CEO was, until recently, twin-tracking his role with the combined West Midlands authority, demonstrating both a weight of influence as a place which will be of benefit to Coventry and the city’s commitment to connecting with the wider regional development. The public realm is being transformed as part of a coherent plan to improve connectivity and cohesion within the city centre and make Coventry a more attractive and vibrant place. Areas of focus include the Station Gateway, the Phoenix Initiative including Priory Place and Broadgate. Coventry is a city that suffered severe bombing during WWII and was significantly rebuilt and redesigned during the 1950s. It is also a city closely associated with the car industry, which is reflected in the city’s post-war design. It is a young city with a diverse population and no dominant nationality – 27 per cent were born outside the UK. It has two of the top 12 universities in the UK. The post war planning and development of the city is well documented and the modern and medieval parts of the city sit comfortably together. It was the first pedestrianised city centre in Europe. Our visit focused in the city centre and had a strong bias towards the role culture is playing in developing the city’s future. Coventry has been shortlisted, along with four other towns/cities, for UK City of Culture 2021. 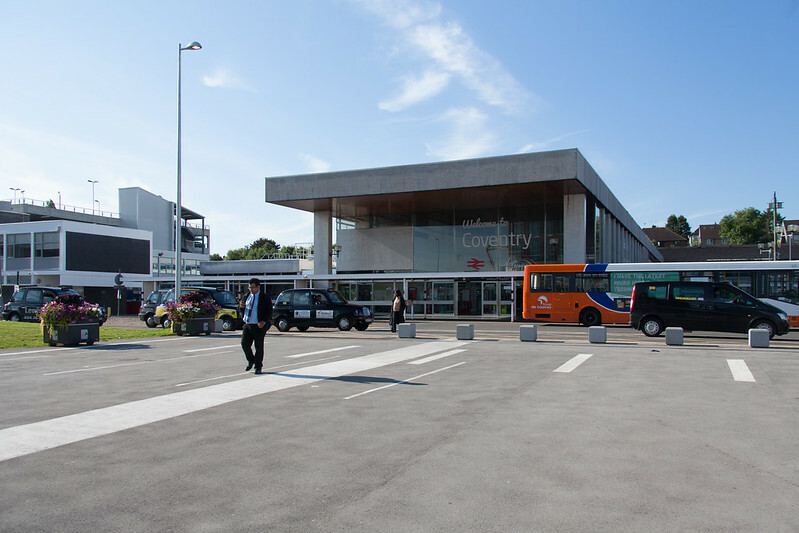 Coventry has made great strides in breaking down the dominance of the car, which originally left the city centre trapped in the middle of a raised ring road, divorced from its hinterland and from the rail station with pedestrian access via underpasses. Much work has been undertaken to make the city much more pedestrian friendly and reduce the impact of the car. The redevelopment and redesign of the Station Gateway, involving the bridging over of the ring road, is remarkable. The £100m Friargate project is creating a new business quarter and provides a landscaped pedestrian-friendly environment. It transforms first impressions of the city, significantly improves access to the city centre and creates a visual link between the listed station and the city centre. Elsewhere we saw how simple interventions like coloured lighting have made spaces where the ring road passes over a street safer and more attractive. We also saw examples of traffic calming and shared space road design to reduce car speeds, prioritise pedestrians and also to integrate different parts of the city. The city is focusing on delivering several big projects including City Centre South and Far Gosford Street. There has been a focus on making places on the edge of the city work better. Overall, however, the city centre, especially the shopping centre, still lacks some coherence and is a work in progress. Plans to reinstate sightlines to the original city centre design will certainly help. Some interventions, for example the new IKEA on the edge of the city centre shopping area, could have been designed to be better connected to increase footfall. Coventry is a youthful city and with an ethnically diverse population and catchment. One of the challenges that the city is addressing, including through the City of Culture Bid, is that the heritage of the city is not the heritage of the incoming population. There is a need to engage the next generation in regeneration and the heritage of the city. The growth in university students and student accommodation is partly shaping the look and feel of the city. Most of the new city centre housing is student accommodation, both new build and above-shop living, but we were unsure of the sustainability of that over time or how that accommodation might be evolved for different occupants in the future. It was unclear how housing needs were being met or managed across the wider city footprint. Coventry has witnessed a steady rise in the number of active enterprises in recent years, at a rate higher than the national and regional average. The National Technology Design Centre is providing incubator facilities for small companies. This recent rapid growth is evidence of a place in transition and growth. Fargo Village, in Far Gosford Street, is an excellent example of Coventry City Council working with developers and the community to conserve and regenerate an area of the city centre, which has encouraged and supported SME growth. The restoration and development of the street has tackled listed buildings, derelict sites and delivered Fargo Village – performance space, business start-up units and a marketplace – created out of former car manufacturing sheds. It is an excellent example of an emerging dynamic new neighbourhood and how the City of Culture Bid is providing a focus and visioning at a local level. The developers leading on Fargo Village are also working with the council on the Coventry Telegraph building in the city centre. The ongoing commitment of the developers and joint working with the council appeared strong and innovative. Overall, Coventry has achieved significant change through partnership working. We understand there is a local strategic partnership and an officer partnership at CEO level, which includes local ‘captains’ of industry. The Heritage Action Zone is a good example of these partnerships. The initiative is working with local volunteers, local communities and key partners (City Council, LEP, universities, the cathedral, Cultural Places Partnership, City of Culture Trust and the Historic Coventry Trust) to make strategic use of the city’s historic environment and promote heritage-led regeneration, to foster sustainable change and economic growth. This will bring at-risk heritage buildings back into productive use, connect the local community to Coventry’s heritage and demonstrate the benefits of heritage to the wider economy. The creation of a 70 acre heritage park based around important heritage assets is particularly impressive and will enhance the attractions of the city as a visitor destination. The transfer of heritage assets to the Historic Coventry Trust is an interesting model which could have wider application and includes the training of young people in traditional building skills. Heritage is viewed and promoted as an important part of the cultural offer of the city. The city council benefits from strong leadership. The CEO was, until recently, twin-tracking his role with the combined West Midlands authority, demonstrating both a weight of influence as a place which will be of benefit to Coventry and the city’s commitment to connecting with the wider regional development. Notwithstanding all these strengths, the overall vision for Coventry is still evolving and the successful delivery of some of the proposed plans and projects will be key to its transformation into a dynamic mixed-use 21st century city. Coventry remains a work in progress. The focus is now very much on the City of Culture Bid driving change and it will be interesting to revisit and review its progress if the bid proves successful.